Photo: (L) Alex Livesey/Getty Images. (R) Shaun Botterill/Getty Images. A preview of the 233rd Merseyside Derby between Everton and Liverpool. Everton welcome Liverpool to Goodison Park on Sunday afternoon for the 233rd Merseyside Derby - looking to pick up their first three points over their rivals since October 2010. 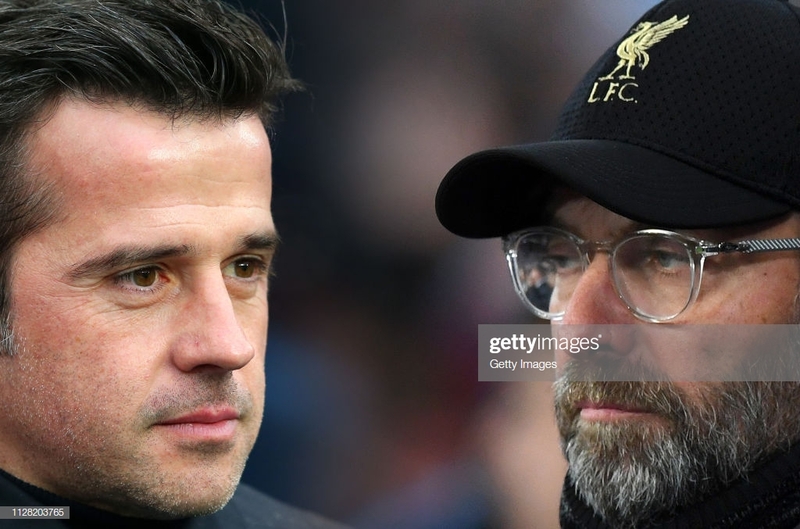 After a solid start to life on Merseyside, Blues boss Marco Silva has stumbled onto a rocky patch that was almost inevitable. A 3-0 win over Cardiff City was a welcome point of relief, but the doubters and their vocal concern remain. So, the 200th league meeting between the two seems like the opportune time for Silva and his men to take some of the growing pressure off their backs. Across the park, the only pressure that is building concerns the Premier League title race. After Manchester City’s win over AFC Bournemouth, Jurgen Klopp’s side sit two points behind - having played a game less than their title-chasing rivals. However, not all is rosy in the Reds garden either. Of their last six games, Klopp’s side have only managed to win twice. A dominating 5-0 midweek win over high-flying Watford eased any potential woes about being able to find the net - after the Reds had failed to score in their two previous games. When the sides last met earlier this season, it took a fortuitously late Divock Origi goal to separate them. Everton, looking to end their nightmare run without a win at Anfield, went toe-to-toe with the rivals for the majority of the game and could have taken the lead on a number of occasions - with Andre Gomes' miss giving hopes towards picking up a result. However, in the dying embers of the game, Origi capitalised on a rare Jordan Pickford mistake to tap home a stoppage-time winner - sending the home support, and Jurgen Klopp, wild. Plenty of pressure will be on Silva to deliver a result of some kind against Liverpool. There will also be personal pressure that Silva places on himself after biting back at Klopp's comments about the game being a 'World Cup Final' for Everton. In his pre-match press conference, Silva stated: “It’s a special game for both. For the city also. For our fans, it’s a special match and for their fans a special match. I didn’t see a big, big difference. When I managed my first Liverpool derby in December what I felt was a special match for both teams. He continued: "They celebrated that lucky goal, that lucky moment they had in the last seconds of the match, like it was a final of a World Cup for us and to them. "The way they celebrated was more or less the same,” he concluded, referring to Klopp's manic late celebrations that landed him a hefty fine from the FA. As he is yet to taste defeat against Everton, the Liverpool boss could be excused for not having to issue a rallying cry before the game. However, he has already called upon his players to perform. "The Everton fans don't want us to win anything and probably for our fans, it's the same,” the German said during his pre-match press conference. “In the game, it's very emotional and passionate, and I hope it's like that again. That's how football should be." He added: "At Goodison, they really support their team so let's go there and use the atmosphere because it will be loud, it will be wild, and we have to deliver on the pitch." The Everton boss could welcome back midfielder Andre Gomes to the starting line-up after the on-loan Portuguese star sat through the majority of the win over Cardiff City on the bench. Silva will also have to weigh up his options after a number of fringe players, mainly Phil Jagielka and Morgan Schneiderlin, impressed during the trip to South Wales. Kurt Zouma is back from suspension and will challenge Jagielka’s place in the starting eleven. There may also be a start for Bernard after he assisted Gylfi Sigurdsson's second goal in the win over Cardiff. Theo Walcott did start the game, but cut a frustrated figure for the majority of the night before eventually being replaced after 82 minutes. For Klopp’s Reds, they will be sweating on the fitness of Roberto Firmino. The Brazillian missed the 5-0 victory over Watford at Anfield on Wednesday evening. Aside from the forward, Klopp’s side should largely remain unchanged. Everton: Pickford, Coleman, Digne, Keane, Jagielka, Gueye, Gomes, Sigurdsson, Richarlison, Bernard, Calvert-Lewin. Liverpool: Alisson, Alexander-Arnold, Robertson, Van Dijk, Matip, Fabinho, Milner, Wijnaldum, Mane, Salah, Firmino. Everton are winless in their last 18 encounters with Liverpool across all competitions - nine draws, nine defeats. It is their longest winless run against the Reds. The Blues have not won on March 3rd since the 1993 campaign - picking up a 2-1 win over Blackburn Rovers. Jurgen Klopp is unbeaten in seven meetings with Everton in all competitions - winning five and drawing the other two, facing four different managers in that space of time.